CRADLE OF FILTH announce North American tour. UK’s legendary extreme metal icons CRADLE OF FILTH will make their long-awaited triumphant return to North America with a headlining tour this March/April. Opening the tour will be Ukraine metal band JINJER. 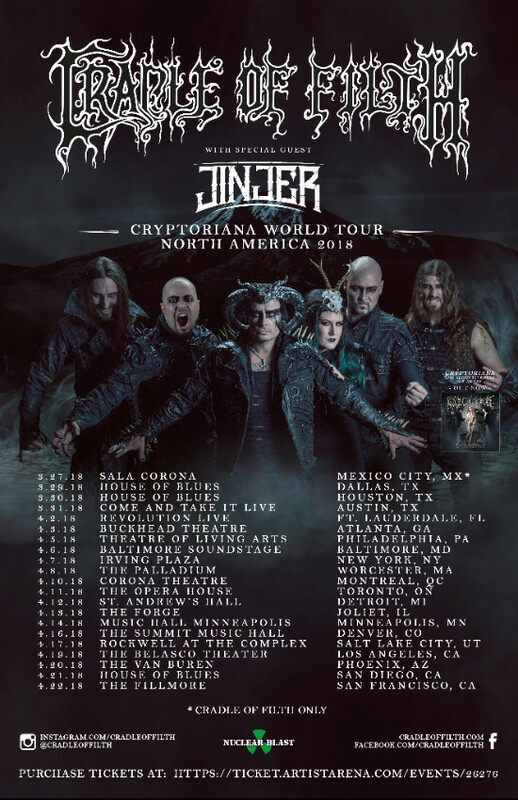 “CRADLE OF FILTH are very much looking forward to the U.S/ Canadian leg of the Cryptoriana World Tour,” commented vocalist Dani Filth. “Even more so now that we have just finished the extremely successful UK run, and with a huge European run ahead of us the band will be totally up to speed, firing on all cylinders and playing a cool, yet eclectic set from the new album and beyond (the extensive ‘Bathory Aria’ from Cruelty And The Beast now being a firm fan favorite). “So get ready for nights of insane gothic horror and vehement perversity come the cusp of April, when CRADLE hit the States where it hurts”. Tickets go on sale everywhere to the general public on Friday, December 1 at 10:00 am local time. VIP packages will also be available and can be purchased here. 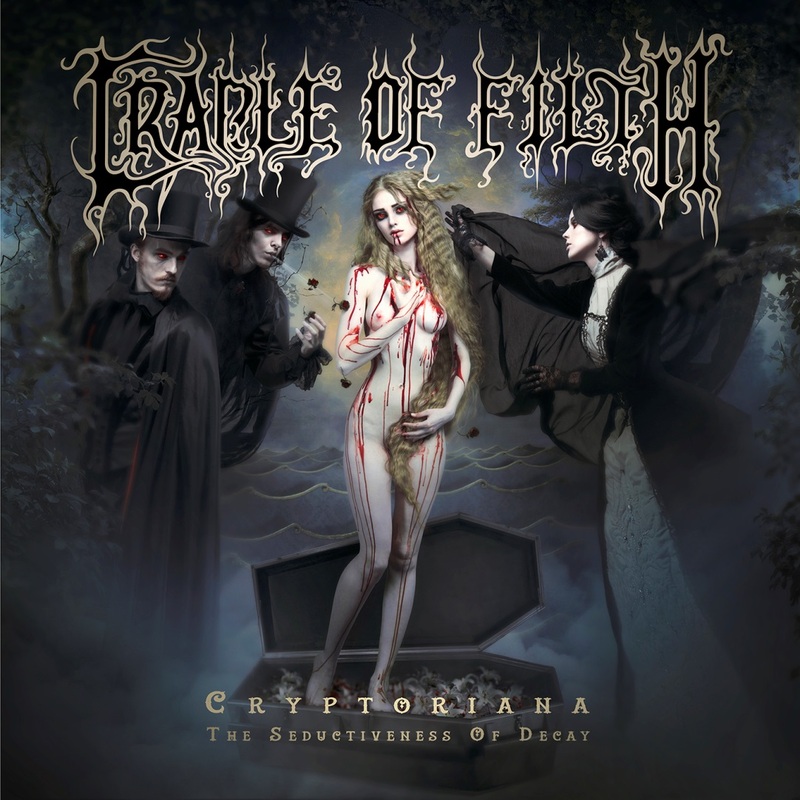 Author capitalchaostvPosted on December 2, 2017 Categories News, Tour DatesTags cradle of filthLeave a comment on CRADLE OF FILTH announce North American tour. UK’s legendary extreme metal icons CRADLE OF FILTH have released the official lyric video for the venomous new song ‘Achingly Beautiful’. The song comes off the band’s upcoming album Cryptoriana – The Seductiveness Of Decay. Commented Dani Filth: “Influenced by the stories of E.F Benson, Sir Arthur Conan Doyle, H.Rider Haggard, Oscar Wilde, Arthur Machen and Algernon Blackwood to shame but a few, this song concerns itself with a spectral guest at a great masked ball who, (deeply embedded in his cruel libertine nature, attends merely for merciless, seductive sport), but instead discovers the woman of his dreams and both bewitching the other, finds in her his dark, immortal equal. Cryptoriana – The Seductiveness Of Decay will be released on September 22 via Nuclear Blast. The album will be available in various formats/editions. Cradle Of Filth premiere music video for new music! K’s legendary extreme metal icons CRADLE OF FILTH have released the music video for the first single off their eagerly awaited 12th album, Cryptoriana – The Seductiveness Of Decay. The album is now available for pre-orders. Pre-orders as well as the music video for ‘Heartbreak And Seance’ can now be accessed here! ​Cryptoriana – The Seductiveness Of Decay will be released on September 22 via Nuclear Blast. Find the stunning cover artwork by Artūrs Bērziņš below. Bērziņš is the mastermind behind the new record’s artwork, photography and videography – best known for his defiant neo-symbolism raster graphics and oil paintings; postmodern interpretations of classic myths. He has been proclaimed as a “sacred monster of Latvian postmodernism”. Author capitalchaostvPosted on July 12, 2017 Categories Music Videos, NewsTags black metal, cradle of filth, nuclear blast recordsLeave a comment on Cradle Of Filth premiere music video for new music! Karkaos has evolved into one of the most reputable and celebrated melodic extreme metal acts hailing from Montreal, QC. Unleashing their debut LP “Empire” in 2014 and EP “In Burning Skies” in 2011, this female-fronted band returns in 2017 with their forthcoming offering “Children of The Void”, which features new vocalist Viky Boyer, drummer Justine Ethier (Blackguard) and lead guitarist Samael Pelletier. Recorded, mastered and mixed with Christian Donaldson and Marc-o Frechette at The Grid (The Agonist, Cryptopsy, Neuraxis, Beyond Creation) and Silverwings Studios for keyboards (Blackguard, Ex-Deo , Distoriam), “Children of The Void” features collaborations with guest artists Lindsay Schoolcraft from Cradle of Filth and Morgan Lander from Kittie. The artwork was made by the immensely talented Marcela Bolívar while the layout was done by Fred Riverin from I Legion. Witch County nefarious frights DEVILMENT – led by vehement front man Dani Filth, will release their forthcoming masterpiece Devilment II: The Mephisto Waltzes on November 18 via Nuclear Blast Entertainment. Today, the band have released the first official music video for ‘Hitchcock Blonde’, premiering exclusively via Metal Hammer. The video was directed by Sam Scott Hunter with a skeleton crew of academic students, with thanks to Film Suffolk. It features actress Leanne Joyce as the Hitchcock Blonde, who has appeared on Britain’s Next Top Model, Call The Midwife and The Royals to name a few. Dani Filth of Cradle Of Filth discusses old school metal favorites, writing with new members and new album. Appearing on the BBC music quiz Never Mind the Buzzcocks on 9 April 2001, Filth jokingly claimed Cradle’s sound as “heavy funk”, and in an October 2006 interview stated, “we’d rather be known as solely ‘Cradle of Filth’, I think, than be hampered by stupid genre barriers. Cradle of Filth are a British extreme metal band that formed in Suffolk in 1991. The band’s musical style evolved from black metal to a cleaner and more “produced” amalgam of gothic metal, symphonic black metal and other extreme metal styles. Their lyrical themes and imagery are heavily influenced by gothic literature, poetry,mythology and horror films. The band’s style has been described as symphonic black metal, gothic metal, “gothic black metal”and even “dark metal”.However, the band’s evolving sound has allowed them to continue resisting definitive categorisation. They are audibly influenced by Iron Maiden, have collaborated on projects like Christian Death’s Born Again Anti-Christian album (on the track “Peek-a-Boo”) and have even dabbled outside of metal music with dance remixes (such as “Twisting Further Nails” and “Pervert’s Church” which was absorbed into “From The Cradle To Enslave – Under Martian Rule Remix”), although these have fallen by the wayside in recent years. Author capitalchaostvPosted on February 22, 2016 February 22, 2016 Categories InterviewsTags cradle of filth, intervi8ew, nuclear blast records, Sacramento CaliforniaLeave a comment on Dani Filth of Cradle Of Filth discusses old school metal favorites, writing with new members and new album.